T.M.A. Haulage Ltd is a TARMAC franchise business operating one 32t Euro 8 wheeled rigid tipper out of Stancombe Quarry, Flax Bourton, Nr Bristol. 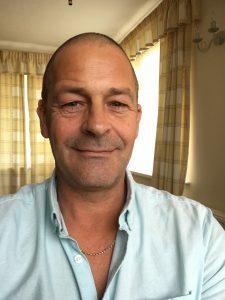 My name is Mr Andrew Tucker and I am the named transport manager and driver for the business. T.M.A. Haulage Ltd is registered in Dawlish, Devon and franchises for TARMAC at Stancombe Quarry which is also our operating centre. Mr Tucker, transport manager for the business is proactively working to reduce fuel use / reduced CO2 emissions, lowered NOx and Particulate Matter emissions, improved our road safety record, decreased transport related fines and charges etc by introducing and communicating the FORS standards and company policies to reduce engine idling, improve fuel efficiency via driver training and monitoring tracker and tachograph analysis data. T.M.A. Haulage Ltd was established in March 2015 to become a franchise operator with TARMAC. As a TARMAC franchise operator we are required to maintain as a minimum FORS Bronze accreditation. As our relationship with TARMAC has developed it has enabled our business to secure an improved revenue stream. To secure more lucrative work we applied for and gained first our Silver and then Gold accreditations. This has also hugely benefitted our business in terms of best practice, road safety and has secured and improved our relationship with TARMAC. Our initial FORS Bronze audit was an extremely positive experience for the business and we passed first time. It was very rewarding in terms of better understanding positive interactions with vulnerable road users, our duty of care to reduce fuel and emissions and to improve road safety standards within the haulage industry. From the initial audit we felt encouraged to progress our business through the standards to achieve FORS Gold and continue our best practice journey. To capitalise on our achievement in gaining FORS Bronze Accreditation and securing our contract with TARMAC on the 30th August 2017 we were approved for FORS Silver standard and on the 17th December 2017, we achieved our FORS Gold accreditation. This has gained our business access to more lucrative contracts with TARMAC. As part of that journey we continue to complete both manager and driver E learning courses, reviewed the 4.1.iii and into 2019 the new FORS 5.0 standards and manage our fuel and emissions data via the FORS performance management system. The benefits for our business have been huge. Andrew Tucker, Transport Manager said ‘Following the huge investment our small business made in January 2018 to purchase a new Euro 6 Tipper, the additional safety equipment fitted to our new vehicle to improve road safety and the vulnerable road user training for myself and our driver we have clearly demonstrated and continue to demonstrate our commitment to the FORS Gold Standard. The benefits of our journey from FORS Bronze to Gold accreditation is an achievement I am extremely proud of. The key benefit of being a FORS Accredited operator has been to secure our contract with TARMAC. This has given our business a level of security that in turn has allowed us to make the investments in the new Euro 6 tipper in January 2018, the additional safety equipment required and the ongoing professional development of our driver. It has also given our business a new focus to reduce our emissions and drive home our road safety objectives. We have implemented a program of continuously updating and reviewing our employee handbook and safe working manual and our risk assessments and have seen improvements in our road safety record and fuel data due to improved driver behaviour. Mr Andrew Tucker said, “We have fully embraced the aims and objectives of FORS. As a small one vehicle business we have gained much from our accreditation. The training and support available from FORS has greatly improved our understanding of road safety. We are proud to display our FORS Gold stickers on our new Euro 6 vehicle and actively encourage all hauliers to consider applying to meet the standards”. The main reason for securing our FORS Bronze accreditation was to meet the requirements of our franchise agreement with TARMAC. The progression to Gold accreditation in particular was to ensure that our business continues to meet the highest standards within the industry by demonstrating our commitment to improving road safety, reducing our emissions and the continuous professional development of our transport manager and driver. Although it appears there is a reduction on the MPG’s in the last 11 months of data it is extremely important to point out that the vehicle, we operated on day work only up to December 2017 was a Euro 5, (engine size 320) 6 wheeled 26t rigid tipper. 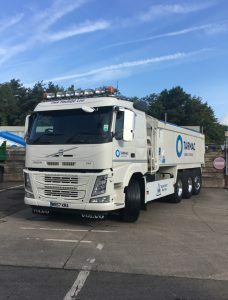 Since January 2018 we have been operating a Euro 6, (engine size 450) 8 wheeled 32t rigid tipper which is operated day and night. The vehicle carries more weight and has a larger engine size for this purpose, the night shift work is heavier and more arduous than the day work but despite this both the night the day time drivers have managed to counter the expected impact on MPG’s by implementing their training to reduce emissions and engine idling to ensure that the MPG’s almost remained the same for a smaller, lighter vehicle and we as a business are extremely pleased with the cost savings on fuel and the reduced environmental impacts of our new Euro 6 vehicle when compared to the older Euro 5 vehicle. Driver health and fitness review – Driver complete a driver health declaration at start of employment and every 5 years thereafter, in addition our driver defect book prompts the driver on a daily basis to declare that they are in a fit and healthy condition and are not under the influence of drugs, alcohol or medication which may affect their ability to drive. Strategy for recruiting drivers – We are a small business operating one vehicle. Whilst we do not have a current requirement to recruit a driver we do support initiatives such as the driver apprenticeship scheme and the FTA skill show. Noise assessment – Within our employee handbook we have a full written policy titled ‘reducing noise and visual intrusion. This was developed from a physical assessment of the operating centre and surrounding area. The policy contains multiple instructions for our employees to ensure noise is kept to an absolute minimum. We also have an engine idling policy as well as an engine cut off system in the new vehicle which will cut the engine off after 15 seconds. Modal shift and alternative vehicles – Our contract with TARMAC prohibits our business from considering alternative modes of transport. In regard to modal shift we have invested heavily in our new 2017 Euro 6 vehicle which we hope will continue to satisfy this requirement. To retain our FORS Gold accreditation would be hugely beneficial for our business and would acknowledge our dedication and commitment to meeting the FORS standards. The benefits are simple… we will continue to secure our contact with TARMAC on going. Our future aspirations include renewing our vehicle every 24 months to ensure we have the cleanest vehicle available, the continuous professional development of our transport manager and driver and the ongoing security of our contract with TARMAC.